Bryan Ferry was born 26 September 1945, Washington, Co. Durham, England. Son of a farmer, who also looked after pit ponies, Fred Ferry and Mary Ann Ferry. Bryan began his musical career in local group the Banshees, following which he enrolled at Newcastle-upon-Tyne University where he formed R&B group the Gas Board, whose ranks included Graham Simpson and John Porter. After studying Fine Art under Richard Hamilton, Ferry briefly worked as a teacher before forming Roxy Music between 1970-1972. During the rise to fame of Roxy Music, Bryan plotted a parallel solo career, beginning in 1973 with "These Foolish Things", an album of favourite cover versions. At the time, the notion of recording an album of rock standards was both innovative and nostalgic. Ferry recorded half an album of faithful imitations, leaving the other half to more adventurous arrangements. Some of the highlights included a revival of Ketty Lester's obscure "Rivers Of Salt", a jaunty reading of Elvis Presley's "Baby I Don't Care" and a remarkable hit single with a version of Bob Dylan's "A Hard Rain's A-Gonna Fall". The album received mixed reviews but effectively paved the way for similar works including Bowie, David's Pin Ups and Lennon, John's Rock 'N' Roll. Ferry continued his success as an interpretative artist with his second solo album "Another Time Another Place" in 1974. Two stylish pre-rock numbers that worked well were the single "Smoke Gets In Your Eyes" and "Funny How Time Slips Away". A gutsy revival of Doby Gray's "The 'In' Crowd" brought another UK Top 20 hit. Bryan took both these albums on to the stage and did his first live date as a solo artist culminating in a show at The Royal Albert Hall 19th December 1974 confirming his status as a major icon of the music world. By 1976, Ferry had switched to R&B covers on "Let's Stick Together" which, in addition to the hit single title track, featured a rousing re-run of the The Everly Brothers ' "The Price Of Love" as the lead track of Extended Play. He also had a minor hit with the Sinatra classic "You Go To My Head". Later that year Bryan recorded the Lennon/McCartney song "She's Leaving Home" with the London Symphony Orchestra for an album called "All This And World War II" with various artists recording songs by The Beatles. It was not until 1977 that Ferry finally wrote an album's worth of songs for a solo work. "In Your Mind" spawned a couple of hits with "This Is Tomorrow" (c/w new song "As The World Turns") and also the single "Tokyo Joe". Bryan took this album on the road which found him performing in all corners of the globe. The following year, he retired to Montreux to complete the highly accomplished "The Bride Stripped Bare". The first single release was a version of Lou Reeds "What Goes On" and followed up with the splendid single "Sign Of The Times" (c/w new song "Four Letter Love") The track "Can't Let Go", written at a time when he considered giving up music, maintained the dark mood. A third single, "Carrickfergus" lack of top 100 appearance and the low chartings of the first two singles were a sign of Bryan's diminishing popularity as a solo star. This was not helped that this was in the height of the punk boom which rebelled everything Ferry represented. Roxy reformed, and any solo work was put on hold. It was another seven years before Ferry recorded solo again. The 1985 comeback "Boys And Girls" was stylistically similar to his later work with Roxy Music and included the hits "Slave To Love" (c/w new piece "Valentine (Instrumental)” and "Don't Stop The Dance" (c/w new piece "Nocturne") and minor hit "Windswept". The "Windswept EP" featured some previously unreleased archive recordings including his version of the Van Morrison song "Crazy Love", Detroit Emeralds "Feel The Need" and a Ferry original "Broken Wings". Bryan hadn't planned any live shows for this album but he found himself performing some of the new album at Live Aid 13th July 1985. In 1986 Bryan was commissioned to write a song for the USA soundtrack to the Ridley Scott film 'Legend' This brought us the ballad "Is Your Love Strong Enough?" featuring Pink Floyd's Dave Gilmour on the guitar and in the video. In the same year, Bryan worked with Nile Rodgers to write the song "Help Me" for the soundtrack to the film "The Fly". This year also brought the compilation album 'Street Life 20 Great Hits' featuring for the first time mixture of both Bryan's solo work and songs form the Roxy Music catalogue. The album reached number one and remained in the album charts the rest of the year and beyond. In 1987, Ferry collaborated with guitarist Johnny Marr on "The Right Stuff" (adapted from The Smiths 'instrumental, "Money Changes Everything"). The album "Bête Noire" was a notable hit indicating that Ferry's muse was still very much alive it also spawned the single "Kiss And Tell" which for the first time he had a song climb higher in the USA Charts than the UK. "Limbo" was released as a single too with a re-mix version by the Pascal Gabriel. In 1988 whilst he took his "Boys And Girls" & "Bête Noire" albums on the road on a world tour, he released the compilation album "The Ultimate Collection". This album was supported by 3 singles. Bryan's classic "Let's Stick Together" was given a 'Westside' re-mix and "The Price Of Love" was given an '89 R'n B' mix. The third single was, until this album, a previously unreleased song left over from The Bride Stripped Bare period, the Jim Reaves Classic "He'll Have To Go"
After his 1988/89 world tour Bryan began working on an album with the title Horoscope. His attention to detail and his strive for perfection meant that Bryan wouldn't let go of the album as he didn't feel it was finished. In 1992 Bryan recorded 3 Elvis songs for the film "Honeymoon In Vegas". He opted to use "Are You Lonesome Tonight?" from these sessions for the soundtrack. This period acted as a catalyst for Bryan to work on an album of songs by other artists. He turned the Horoscope canvas to the wall (to use Bryan's own artist description) and worked on the covers set "Taxi" which was released in 1993. This album spawned the hit singles "I Put A Spell On You", "Will You Love Me Tomorrow" and the Elvis song "Girl Of My Best Friend". This brought Bryan back to the public eye with appearances on Top Of The Pops and many prime time TV shows. In 1994 the "Horoscope" canvas was turned around and Bryan, with a new approach learned from his experiences in the "Taxi" sessions finished the album of originals and gave it the title, "Mamouna". The album's production is polished, his singing developed with age taking Bryan's sound one step further. Bryan took this album on the road and did an extensive world tour from 1994 -1995. Despite lack of commercial success and the low chart appearances of the single "Your Painted Smile" and the title track "Mamouna" this is one of Bryan's finest works to date. In 1996 a song was written by Elton John lyricist Bernie Taupin and Martin Page called "Dance With Life (The Brilliant Light)". They invited Bryan To record this for the John Travolta film "Phenomenon". After the tragic death of Diana Princess Of Wales in 1997 Bryan recorded "Shakespeare's Sonnet No 18" with Michael Kamen and his orchestra. This recording was to appear on "The Diana Tribute Album". In 1998 a tribute album to Noel Coward called "Twentieth Century Blues" was released with a version of "I'll See You Again" recorded by Bryan Ferry. After a chance meeting with arranger Colin Good, Ferry returned with the album "As Time Goes By" in 1999, on which he tackled the Thirties and Forties standard songbook. He released "As Time Goes By" as a single that included a new recording "If I Didn't Care". Bryan performed "Falling In Love Again" on many prime time TV shows to promote the album. This had been a long term plan of Bryan's and he felt this was the right time to do the album. The album and the tour following was a huge success. During this tour he was overwhelmed at the response to some of the more obscure Roxy Music songs that he performed that he was inspired to reform Roxy Music. In 2000, Bryan released a compilation album "Slave To Love" this album concentrated on the ballads that Bryan had recorded over the years as both a solo artist and with Roxy Music. The album featured a new song, Craig Armstrong & Jerry Burns' "This Love". A re-recording of Roxy Music's "Mother Of Pearl" by Bryan Ferry was released on the soundtrack to the film "Ordinary Decent Criminal"
Bryan announced with Phil Manzanera & Andy Mackay in 2001 the they would take Roxy Music on a reunion tour in 2001, the first tour in 18 years. This tour proved to be a huge success with 51 dates in UK Europe Australia & Japan finishing in Hammersmith Odeon 2nd October 2001. This date was filmed for a DVD released in May 2002. The busy touring schedule meant that the only new material released during 2001 was Bryan's version of the Elvis song 'Don't Be Cruel'. Bryan Recorded this song with some of Elvis's original band members Scotty Moore & DJ Fontana for the Sun Records tribute album 'Good Rockin' Tonight'. After the Roxy tour and a short holiday Bryan returned to many archived unreleased recordings he has done over the previous 10 years as well as some recent recordings. He recorded a lot of material in the 1990's with people like Robin Rimbaud (Scanner), Dave Stewart, Bernard Butler, Bjork, Sinead O'Conner, Jonny Greenwood, Edwin Collins, Brian Eno, members of his 1999 touring band, and many others. Some of this material found its way on to the 'Frantic' album released April 2002. The first single 'It's All Over Now Baby Blue' was released in mainland Europe April 2002 with 'Goddess Of Love' being the UK single in May 2002. These singles also included 'Smoke Dreams Of You' which was left over from the As Time Goes By sessions. 'One Way Love' was released as a single in Germany in 2002 and Bryan continued the 'Frantic' tour until December 2002 and followed this with an appearance at the Vatican performing 'A Fool For Love' with Chris Spedding, Paul Thompson and an orchestra. Bryan Continued performing live throughout 2003 & 2004 and also released the 3 CD Compilation 'The Platinum Collection' which included 45 singles from both the Roxy Music & Bryan Ferry canon. Roxy Music did a mini tour in 2003 and 2005. The 2005 dates were announced with the news that the band are working on the first Roxy Music album since 1982's Avalon. The band also did some dates in 2006 but soon after that, Bryan Ferry went into the studio to record an album of Bob Dylan songs. This album 'Dylanesque' was released in March 2007 with a tour of UK, Europe & Australia taking up most of the rest of the year. Bryan finished off the Dylanesque tour in 2008 and began working on a new solo album. 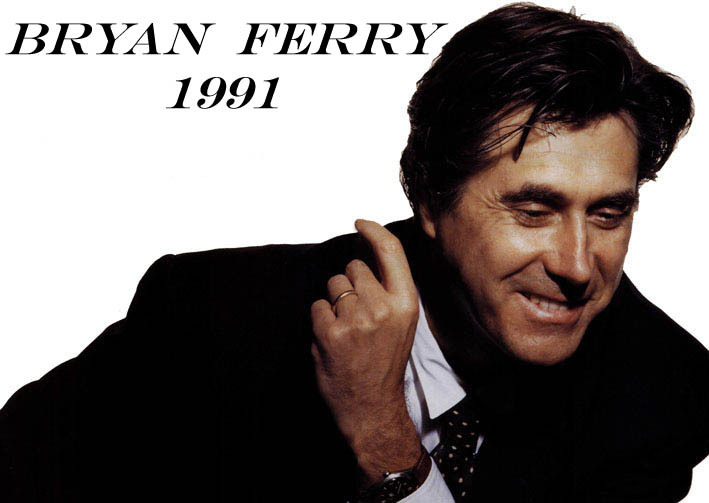 In the interim The Best Of Bryan Ferry, a double disc was released featuring tracks form Bryan's solo albums and the second disc featured many promo videos from the archives as well as rare and previously unseen TV performances. Bryan released his 13th solo album ‘Olympia’ on 25th October 2010. The album’s first single ‘You Can Dance’ was released 2 months earlier. He tourerd the album the following year taking in UK, Europe and USA. In 2012 bryan released 'The Jazz Age' an instrumental album of 1920's versions of his solo work and Roxy music songs. He toured the following year with The Bryan Ferry Orchestra and at the same time worked on the follow up to Olympia which is due some time on 2014.